Orbitsound T12v3 review | What Hi-Fi? This is the third incarnation of the Orbitsound T12. Sporting superior components inside the speaker and an upgraded subwoofer, the system aims to improve the sound from your TV and comes with the added bonus of an iPod dock. The USP is spatial sound, and there are three modes designed to spread sound around the room to varying degrees and eliminate the traditional sweetspot. There are both analogue (stereo/ 3.5mm) and digital (optical/coaxial) audio inputs, plus composite video outs for watching iPod videos on TV. No HDMI connections, though. Sonically it’s a blast. It’s capable of going seriously loud and delivering staggering bass weight. 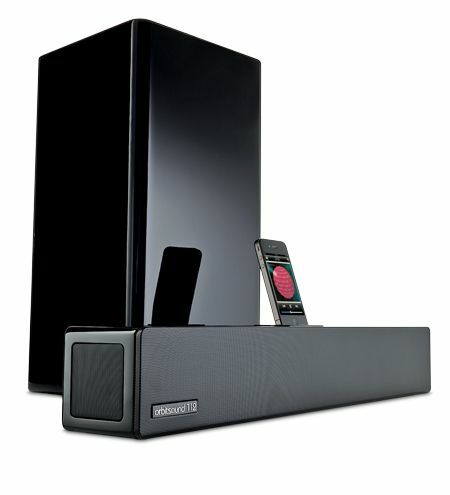 We prefer the ‘normal’ sound mode – ‘wide’ swamps the room – but find it hard not to enjoy the party. TV dialogue has authority and clarity, and plenty of that heft, too. The sub could be better integrated –wireless would be handy to improve placement options – but for the money it’s hard to argue if you like it loud and proud.